I absolutly adore horses and ponies. Ever since I was realy young I have always wanted one of my own, but I am not allwowed one because they are really expensive and they need alot of looking after. Instead, I go to a riding stables every Sunday, and sometimes more often in the school holidays. I get there for 8 o'clock in the morning and leave sometime between 4:30 and 5:30, depending on the weather and the time of year. I have made lots of friends there, and when we are there, there is a group of us who help with mucking out the stables, feeding and giving the horses and ponies water, leading the beginers when they ride, and other stable jobs. For doing this, we get a free ride every two weeks, which is really cool. We have loads of fun when we are there, and have great rides together. My favourite pony there is called Missy. She is really cute and pretty, and I ride her all the time. She is only 11h 2, but I am really short so that's ok :) I think I am going to grow out of her soon though. She is bright bay pony, and either a welsh section A or C, I get muddled up between the two. When she first came to the yard, She was really jumpy and hard to ride. She was always bucking me off, and it was rare that we went on a ride when I did not fall off once. One time when I rode her, she even managed got me off twice in the same field. Since then though, she has calmed down alot. I do not fall off her as much, only really when we do round the world and scissors in the school - I'm really bad at that. One of my friends at riding is Alice, she rides a dark bay exmore pony called Harmony. We both love jumping and racing in the fields. There are lots of other ponies at the stables and my favourite horse is probably Dandy. Lydia and Helena ride him. He is about 14h 3, and is a really good jumper, and he can also go really fast in the fields, even if he is a bit lazy in the school. 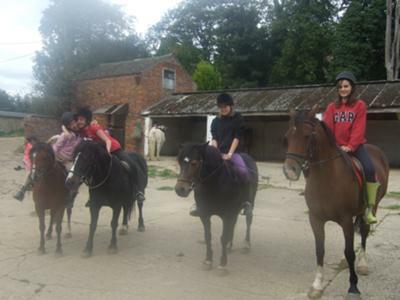 One ride I really enjoyed was when my friends an I went out on a hack. We went through a group of fields that the horses really enjoy, so we always end up galloping. It was great, there were loads of branches and tractor tracks in our way, which the ponies all leaped over. It's a really fun ride, but the only bad thing about it is the long walk back along the road at the end. The last half of the ride gets really boring, but it was really great this time, because Lisa said we could turn around at the end of the fields and go back the way we came. It was really fun, because we turned around in canter, but just at that moment, Katie, one of the other ponies, decided to go for a wee. Because she was at the back of the ride, no-one noticed until we got to the gate, and saw Katie slowly cantering up to us from the other end of the field. It was really funny, and we had a great galloping ride back.